1. Preheat the oven to 190ºC, gas mark 5. Fry the steak until browned on all sides. Stir in the flour and porcini paste, cook for 30 seconds, then gradually blend in the stock and vinegar. Bring to the boil, then transfer to a small ovenproof casserole dish. Cover and bake in the oven for 2 hours. 2. Stir in the mushrooms and add half the thyme sprigs, re-cover and cook for a further 15 minutes. 3.Cook the cavolo nero and mashed potato according to pack instructions, then drain. 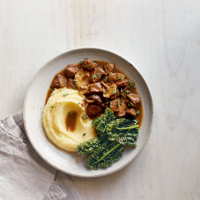 Remove the sprigs of thyme, and scatter the leaves from the remaining thyme over the casserole and serve with the cavolo nero and mash.